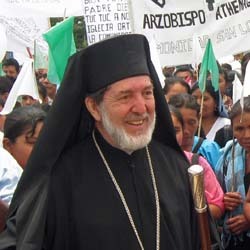 The Mayan Orthodox parishes in Guatemala and Southern Mexico are in the Greek Orthodox Metropolis of Mexico under the omophorion of His Eminence Athenagoras (Archbishop of Mexico, Central America, the Caribbean, Colombia, and Venezuela). As such, the parishes in Guatemala and Mexico come under the jurisdiction of the Ecumenical Patriarch, His All-Holiness Bartholomew. Fr. 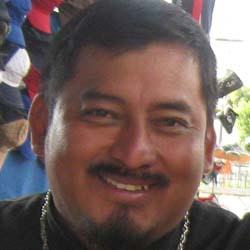 Evangelios is the vicar of His Eminence Athenagoras for the churches in Guatemala and in Chiapas, Mexico. He is based out of the village of Aguacate, where he is the rector of the Holy Annunciation Cathedral. He also is the pastor for approximately 80 church communities in Guatemala and Chiapas, Mexico. Fr. Mihail is based out of Nueva Concepción, in Escuintla. He is the rector of the St. Joseph Chapel as well as the director of the Centro Pedagógico, a highly regarded high school founded by Fr. Andrés Girón. Fr. Alexios is the rector of the Church of the Most Holy Theotokos of Perpetual Help, in Tajumuco. 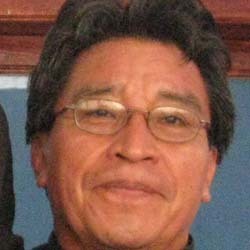 He also teaches at the Centro Pedagógico in Escuintla. Fr. Blas is the rector of the Church of the Holy Dormition in Conrado de la Cruz, Escuintla. He also is the pastor for about 10 church communities along the coastal region of Guatemala and Chiapas, Mexico. Fr. Daniel is the rector of the Church of the Holy Ascension in Pebil Pam. He also is the pastor for about 20 church communities in the highlands of Guatemala and Escuintla.